Bead heads, the stuff of controversy between the purist element of our sport and those that just like to catch fish. I like to view myself as someone that is working towards being a complete fly fisherman and to me that means being able to use any technique and matching that technique strictly to the situation. This can be extended to a broader idea of using whatever is most likely to be effective (but beware lest you begin using bait). Depending on the situation, effective may mean catching lots of fish, or perhaps catching a large fish, or maybe a specific difficult fish. Often this means fishing nymphs and while they may not necessarily be more effective, bead head nymphs do make things easier. For example, if I'm feeling a bit lazy I tie on a strike indicator (gasp!) and a bead head. This is only for fishing that is farther than 10 feet or if I'm expecting very light takes where a visual is helpful beyond simply the end of my line or leader. Of course, strike indicators can be very helpful in the right situation or to get a beginner into fish quickly. For example, a couple of years ago I got my cousin into his first trout on the long rod within just a few short minutes with a bead head Tellico nymph under an indicator. He went on to catch several more on his own, quickly picking up the basics of reading water. In fact, he kept me busy enough with the camera that my own fishing started to suffer. Of course, that's a good problem...a beginner can never catch too many fish. Even guides turn to bead head nymphs when a novice fly angler shows up wanting to catch some easy fish. And why is it so easy? It’s really quite simple and the answer is found throughout fly fishing literature. 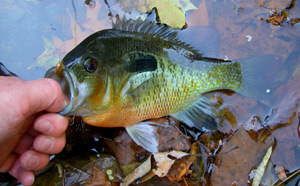 A couple main factors combine to make the bead head nymph so deadly. First, the bead head provides weight. One of the biggest challenges facing a first-time nymph fisherman is getting the fly down where the fish are. Even more experienced fisherman find themselves adding split shot to get their fly down. My recent trip to the Cherokee trophy water comes to mind to demonstrate this point. The nice rainbows I caught came on a rig that included a Tellico that had a bead head already but I added another 3 #6 split shot to get my fly down. Two just was not enough but as soon as the third split shot was added, I started hooking up quite often. Using a bead head is extremely beneficial in getting the fly to quickly penetrate the water column and sink to the bottom. One of my favorite Smokies flies is a bead head Tellico that is also tied with a generous amount of lead wire creating one of the heaviest flies you can tie in the smaller sizes. When combined with an indicator, it becomes deadly even in the hands of a relative novice. 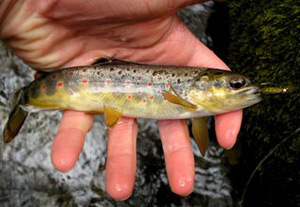 In the hands of an expert, an indicator isn't usually necessary on the small mountain streams and that same expert will catch lots of fish the beginner will miss. As much as weight may be the main factor in the success of the bead head, I believe another factor is important as well. Flash, sparkle, an attention getter, the bead head is all of the above and this could well be argued to be the most important aspect of a bead head nymph. Sometimes the fish just want to see a bit of glitter and while it may not be pure, it sure catches fish. While some people prefer to stick strictly to natural materials for fly tying, they are once again limiting themselves. Sure, it may take more creativity but as much as I enjoy exploring my artistic abilities, when I sit down at the fly tying bench I want to crank out the most efficient fish producing flies possible. Often this means taking a very popular nymph and simply adding a bead head. To a lesser extent (or perhaps greater, who knows), the bead head also adds a different element to the profile of the fly. When I see so many extremely flat little critters in the water, I'm sometimes tempted to wonder why the bead head actually catches fish. The large round bulb at the front end of the fly certainly doesn't look exactly like something in nature, but that is part of the game. Often instead of a perfect match, something that is more suggestive works wonders and the bead head is the perfect example. I'm still looking for my first bead head pheasant tail hatch and if I find it, I'll probably make history. In the meantime, this little fly will continue to catch many gullible trout around the world. Often I am asked onstream about what I've been having success with. More and more lately my reply involves some type of bead head. Some of the best fish catching machines have a bead head. On tailwaters, you'll often find me fishing a bead head under a dry fly for an indicator. Only when a hatch occurs and fish start rising will you find me changing tactics. In the mountains, I usually start with a nymph as well until the fish tell me otherwise. The water and fish are always talking to you, telling you what to do to be successful. The key is careful observation and learning each lesson thoroughly. A quick rundown of favorite bead head nymphs include the Pheasant Tail, Tellico, Zebra Midge, and Copper John. The first three can be tied either with or without a bead head and the last was designed specifically for use with a bead head. All are fish catching machines that should be in any fly box. While the purists are sitting on the bank waiting for signs of hatching bugs and rising trout, you'll be standing knee-deep in the trout stream landing fish after fish...I'll see you there!!! VISIT DAVID KNAPP'S WEBSITE HERE!